You have to earn the right to be a classic. Even as a native New Yorker, there is something so quintessentially New York about being in the Financial District. Walking the cobblestone clad streets of the Wall Street area, you can feel the powerful business vibes and history of the city. There's nothing really that cements that feeling better than an iconic steakhouse—enter Harry's. I sat with a friend in a red pin-tucked couch corner booth enveloped by the kind of romantic movie glow that you can only see in a sub-leveled windowed space and took in the room. You can feel the timelessness of the restaurant. As my eyes were magnetically pulled to the "beam me up, Scotty" styled central vertical linear light fixture, I realized I was listening to laid back Top-40s music—what an enjoyable modern twist! It was right about when I was commenting about this to my friend that founder Harry Poulakakos walked over to chat with us. Awed by his humbled kindness, in that moment, I knew I wanted to write this article if for no other reason than to thank him and praise him for his wonderful restaurant. He told us about how he opened the doors to his namesake restaurant in 1972 and has been there ever since. Oh, I can see why this restaurant has stood the test of time and even opened up additional locations. Harry's does steakhouse right! If you're looking for a really amazing steakhouse in the city, you can stop your search, you've found it. From the masterfully cooked N.Y. Steak On The Bone to the oh-so-pescatarian friendly Squid Ink Linguini with Shrimp Scampi, there is something delicious on the menu for everyone. CAUTION. Don't get too full because they have a killer dessert menu. 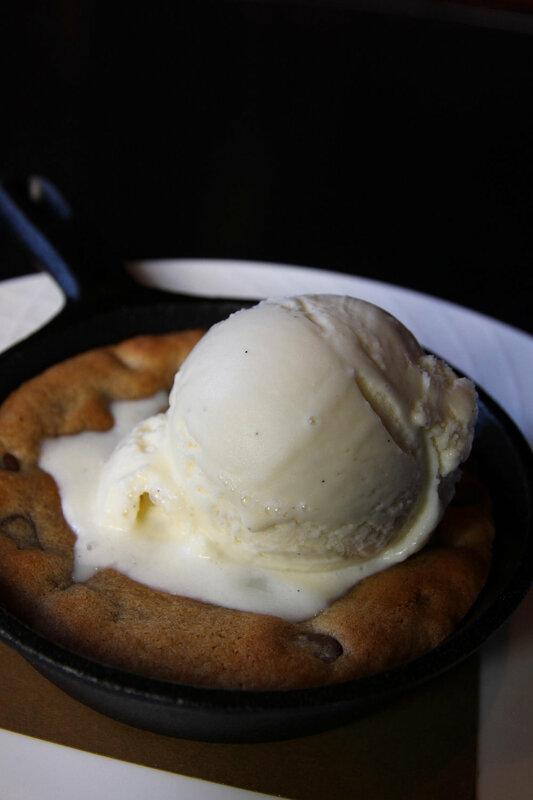 The ooey-gooey Cookie & Cream Skillet is unskippable. You need it. Even if you are "too full" figure it out and order it, trust me. If that's not your kind of dessert, I did you a favor and tried the Lemon Meringue Pie, too. And, yes, it's 100% worth ordering. Go do classic New York right. You will be so happy you did!